Make your own hobby horse. It's easy! Cindy Littlefield at Family Fun has this great horse craft. 1. Cut off one jean leg about 2 feet up from the hem. Turn the leg inside out and use string to tightly tie the bottom closed. 2. Now, turn the leg right side out and glue on felt eyes and nostrils. 3. For the horse's mane and forelock, arrange 8-inch lengths of yarn into four bunches of 35 strands. Tie each bunch in the center with another strand. 4. Starting 2 inches above the horse's eyes in the center of the pant leg, cut 8 3/4-inch vertical slits (spaced a half inch apart). Weave one bunch of yarn through the first two slits, so that the ends stick out and resemble a forelock. Weave the other bunches through the remaining slits to create the mane. 5. For ears, cut the back pockets from the jeans and use string to tie the tops closed. Cut ear slits in the head and insert the tied ends of the pockets into them. 6. Stuff the horse's head (up to its ears) with polyester filling. Insert one end of the wooden dowel. Then, pack the neck with more filling and tightly tie the lower edge of the neck to the dowel. Finally, tie a string bridle around the horse's nose. A piece of fabric for the horse about 22" X 21"
White craft glue or hot glue gun (not to be used by a child)or if you want to make it more difficult use a sering machine! Use the pattern below It can be enlarged if needed. Fold your fabric in half, right sides together making an 8 1/2" by 12" rectangle. Put the cardboard template on the material and trace around the fabricdirectly onto the wrong side of the fabric. This is a template so the drawn line is your sewing line. Sew around the horses head. leave it open where marked. Clip the curves and turn. Place a narrow hem around the opening. Stuff the horse head firmly leaving a slight hollow in the center to add the dowel stick later. 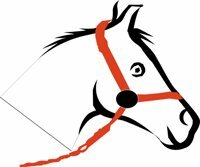 Place the ribbon or cord around the horse's nose using the pattern as your guide. Use your glue gun to tack it in place or sew it. Follow the template pattern for the halter with the ribbon. Stitch the reins part of your ribbon to the halter section at the grey circle as shown. Loop the reins to the back of the neck and tie in a single overhand knot. Place the two buttons or velcro one on each side of the head to cover the joint between the halter and reins. stitch through the horse head attaching both buttons or velcro at the same time. Add the dowel or stick by placing a good amount of white craft glue on the top several inches of the stick, or use your trusty glue gun. Insert the stick into the hollow you left in the stuffing. Spread some more glue on the stick at the level of the gathers to seal the stick to the fabric. Place a double row of gathering threads about 1 1/2 inches above the hem in the opening, add more stuffing if needed. Pull up the gathers so they fit tight around the stick and are in contact with the glue, add more glue if needed. Tie off and trim the threads. The mane and forelock can be made by stitching cotton fringe along the pale green line from the horse's ear to the opening and in front of the ear. If you use yarn , wrap several times around your hand forming a loop of yarn. This is stitched along the line until you have a pleasing mane and forelock. You may choose to leave the yarn looped or cut the loops for a different look. Tie a bow or a bandana around the stick to cover the gathers. Remember to make it easier - just use a glue gun and use markers to draw on the eyes, nose and mouth. Use string, soft rope, ribbon, or braided wool for the halter and reins. If you hate to sew - use felt instead of material for the horse head. Cut out different colored felt pieces for the eyes, nose and mouth and glue them on with your trusty glue gun. Cut out the hobby horse head from 2 pieces of felt and glue the edges together with...your trusty glue gun. Glue the halter on with a few dabs of glue...with your trusty glue gun. Stuff the hobby horse head with fiber batting. Use an elastic to bunch up the neck of the horse to the stick (use the glue gun to keep the stick in place). Tie a bandana or wrap a long piece of felt (3 inches wide by 12 inched long around the stick which joins the neck of the horse. Now That Was Easy!! Click for the hobby horse template. Move From Hobby Horse Back To Horse Games.